Peanuts are popularly known as singdana or mungfali. Contrary to what their name implies, peanuts are not true nuts but a member of a family of legumes related to peas, lentils, chickpeas and other beans. Peanuts start growing as a ground flower that due to its heavy weight bends towards the ground and eventually burrows underground where the peanut actually matures. The veined brown shell or pod of the peanut contains two or three peanut kernels. Each oval-shaped kernel or seed is comprised of two off-white lobes that are covered by a brownish-red skin. Peanuts have a 15 GI making it a low GI food. Peanuts are almost consumed with cocktail snacks, and the ever-popular peanut butter and jelly sandwich. Due to their high protein content and chemical profile, peanuts are processed into a variety of different forms, including butter, oil, flour, and flakes. Is peanuts safe for diabetics? The foods with high glycemic index and glycemic load causes sudden spike in blood sugar levels after eating. A handful of peanuts (approx. 28 grams) are low in GI (14) as well as GL (1) due to the presence of good fats (MUFA), high protein content, fair amount of fiber and carbs. Such a combination of nutrients imparts a positive effect on the blood sugar levels. 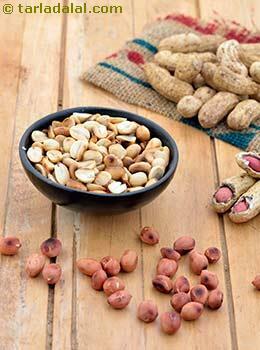 You can munch on peanuts as a healthy snack in between meals instead of carbohydrate rich snack. Thus maintains blood sugar level and also lowers your blood cholesterol profile. Since peanuts are very high in omega 6 fatty acids which is known increase inflammation and no omega 3 fatty acids at all, it is always advisable to balance the ratio of omega-6 and omega-3 fatty acids by pairing your peanuts with omega-3 fatty acid rich sources. Peanuts being high in magnesium (provides 12% of the daily recommended magnesium), plays a significant role in releasing and increasing the effectiveness of insulin, thus reduces insulin resistance and improves blood sugar levels. Due to high potassium content, peanuts aids in regulating your blood pressure. Is peanuts suitable for weight loss? A handful of peanuts (approx. 28 grams) provides you around 159 calories and that’s quite high. Since peanuts are pretty high in calories and fats, have only a small handful of them and limit your snack so that it provides you enough energy and satisfy your hunger. However, it provides you good amount of protein and fiber as well, which aids in slow digestion and make you feel satiated for a longer period of time. Thus controls your appetite. It is also very rich in omega-6 fatty acids, thus instead of eating peanuts alone combine it with omega-3 rich sources such as walnuts. This is to balance the ratio of omega-6 and omega-3 to reduce the risk of inflammation.